If you run a blog that has decent number of visitors you probably already researched a bit how to properly monetize your blog. First thing most bloggers do is sign up for Adsense. While Google based advertising network is great there are numerous other Ad Networks that might be better suited for your particular content. For instance BuySellAds is the most popular ad network for design / programming related blogs (we use it also). You can also sell ads directly but for that you will need a good tool to manage your advertising campaigns. You need to track when ads will expire, set number of impressions, monitor click through rate and many other aspects of the advertising campaign. Below is a list of the best free and premium WordPress Plugins for managing Advertising Campaigns. They are either meant for a specific ad network or for selling ads directly. , cache busting, lazy loading, ad blocker, AMP support, popups, sticky ads and many more useful tools. This 3D ad rotator is best suited for smaller banners (125×125) and will fit perfectly into your sidebar. You can add it as a widget into the sidebar or via shortcodes in your posts and pages. 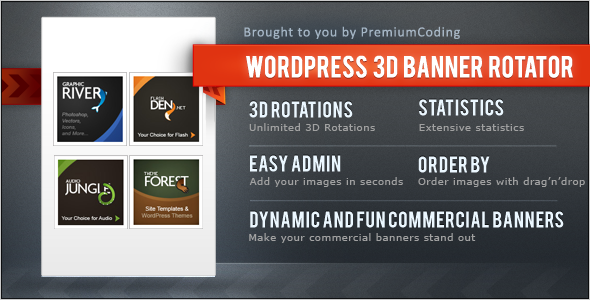 Banner uses a wide range of different 3D rotations and will make your ads stand out from the rest of the website. That will maximize the click through rate and that is the most important factor of any advertising campaign. There is also an extensive statistics panel with graphs. You can see how much impressions and clicks each image within each banner has and what the CTR rate is. uAd is a powerful fully integrated WordPress advertisement solution that supports all standard banner sizes (from 16×16 to 728×90). You will be able to track impressions, clicks, set maximum clicks per ad, add date limitations and set priority of banners. OIO ad manager for WordPress will maximise your revenue and will allow you to have complete control of your advertising campaigns. You can also run 3rd party ad networks beside your own ads. You can get this script as a standalone platform also meaning it is suitable for all platforms and not just WordPress. 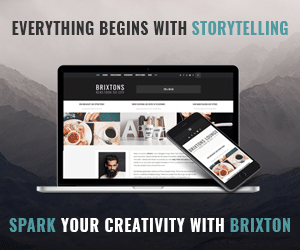 Billboard wordpress plugin allows you to add images, photo galleries, Facebook photos, covers of reviewed books to your widget ready sidebars and present them as advertisements. Adrotate is one of the most widely used advertising solution for WordPress. 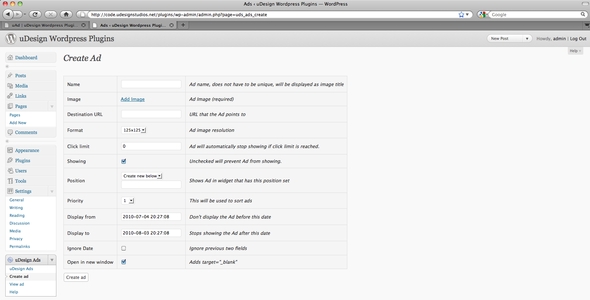 You can easily add and manage your ads from wordpress dashboard and show banners anywhere on your website. 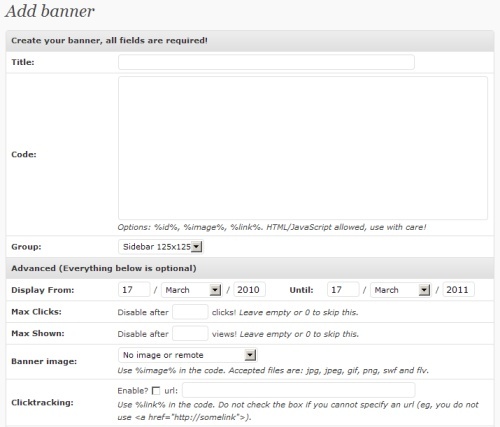 You can have unlimited groups for banners which means you can tie certain banners to different areas of the website. 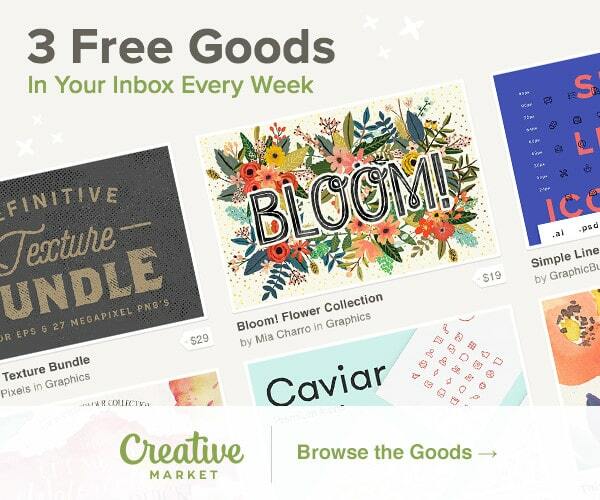 You can set email notifications when ads need your attention. Simple statistics that will help you determine which add is the best. 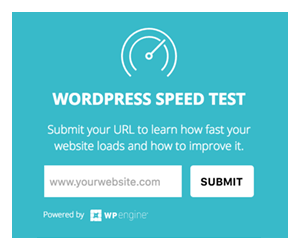 Advertisers are able to contact you from their own WordPress dashboard. Adsense is the most popular advertising network out there and there is a lot of plugins that will implement Adsense code into your wordpress blog. WhyDoWork is one of the best and will allow you to easily insert the code and set it exactly like you prefer. Up to 10 sets of adsense codes can be defined and displayed on different posts and pages. You can also exclude ads at certain posts or pages. Most of design and programming blogs, including PremiumCoding, use BuySellAds as their advertising provider. This wordpress plugin will allow you insert BSA code anywhere on the website. All you have to do is enter BSA key and plugin is ready. Ad Injection is an all around solution for monetizing your wordpress blog. You can add any kind of advertisements or ads from popular networks (Google AdSense, Amazon Associates, ClickBank, TradeDoubler, etc). You can control how many adverts is in the post or page based on number of words (length of the post). You can also restrict adverts by post age, IP address and referers. There are numerous WordPress Advertising Plugins out there and some may be more suitable for your particular blog then the ones reviewed in this article. 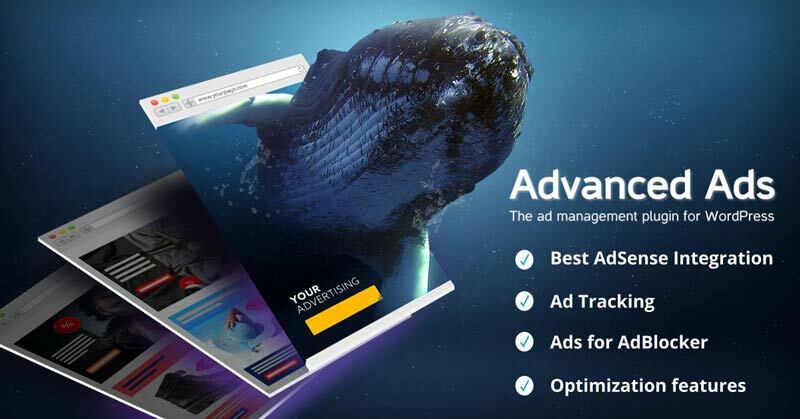 List above is an all around list of the best WordPress Advertising plugins that will help you whether you wish to implement ads from popular network like Adsense, or will run your own advertising campaigns.